A fantastic set of Mojito goodies. Perfect for gifts! Our hand wash is the perfect way to share your excellent taste in body products with all your friends. No-one wants that old bar of soap you’ve had hanging about for ages. Delight your guests with a gorgeous bottle and an amazing scent. (Or make sure to hide it well if you don’t like to share!) Use alongside our hand & body lotion for the perfect hand washing experience. Our bath & body wash is so amazingly versatile. 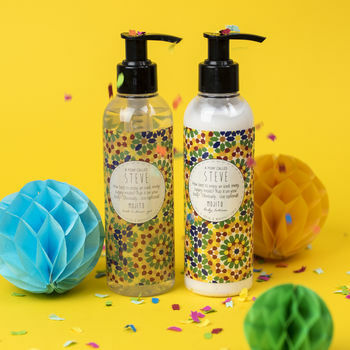 It works perfectly as both a bubble bath and a body wash. Bath lovers rejoice and dedicated shower fans can be made equally jubilant with our fabby wash. Use it to clean away the stresses and strains of the day and let the fun scents make you smile. Both these delicious products are made using 98% natural ingredients and is vegan friendly. Choose which you would prefer in your set. Our hand & body lotion is perfect to add lasting scent & soften skin. Made with sweet almond oil, lavender flower extract, comfrey leaf extract, ginseng root extract, camomile flower extract to soften and gently moisturise skin (without leaving it oily). This lotion is vegan friendly. Sharp, zesty lemon & tangy, ripe lime juice muddled with sugar and super fresh mint. This is the perfect blend of citrus & sweet! Aqua, Ammonium Lauryl Sulfate, Cocamidopropyl Betaine, Cocamide DEA, Parfum, Sodium Chloride, Polyquaternium 7, Phenoxyethanol, Citric Acid, Methylchloroisothiazolinone, Methylisothiazolinone, Benzyl Salicylate, Butylphenyl Methylpropional. This product is dispatched to you by A Pony Called Steve.